Horse racing — often referred to as the ‘Sport of Kings’ — has existed in its current form since ancient times, and has since become a mainstay of just about every civilisation through human history. Archaeological records show that horse racing dates back as far as ancient Greece, Babylon and Egypt. These days horse racing is a sport that captures the imaginations of crowds the world over. Over 100,000 people flock to Flemington for the Melbourne Cup in Australia, massive crowds of consistently over 150,000 hit the course for the Kentucky Derby in the United States and more than 50,000 watch the greatest jumps race in the world, the Grand National, be fought at Royal Ascot in England. Annually, horse racing is by far the most gambled upon sport in the world, with billions punted on it across the globe. Online sportsbooks take a large percentage of this turnover, with most countries having some form of regulated betting. The Melbourne Cup: The crown jewel of Melbourne’s spring carnival, the Melbourne Cup is the one of the world’s richest races. Raced over 3,200 metres, the Melbourne Cup attracts the world’s best horses from around the globe, as is referred to down under as the ‘race that stops a nation’. It is run on the first Tuesday of November every year. 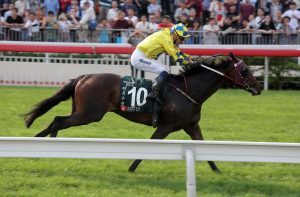 Hugh Bowman guides Werther to a win in the QEII in Hong Kong. The horse was bred in New Zealand and trained in Hong Kong. Bowman is from Australia. This showcases the global nature of the modern racing industry. The Kentucky Derby: Part of America’s famous ‘Triple Crown’, the Kentucky Derby is without question America’s most famous horse race. Held annually since 1875, the Kentucky Derby routinely draws enormous amounts of money, with Americans outlaying hundreds of millions of dollars on one of the world’s most recognisable races. The England Grand National: The English Grand National is more than just a race, it is an event. The Grand National is the world’s most famous steeplechase, but has not been without its controversy – given the arduous nature of the five mile, 35+ runner horse race. That does not stop the money flooding in for the race, with millions of pounds pouring in every year at Aintree. Dubai World Cup: The Dubai World Cup is in its infancy compared to the other big name races listed here, but it is now the world’s richest horse race – given the gigantic prize pool of 10 million USD. First ran in 1996, the Dubai World Cup is raced over 1.25 miles on the dirt at Meyden, the amount of money spent on this race is insane, with hundreds of millions of dollars wagered on the race. Prix de l’Arc de Triomphe: Is a group 1 feature at Longchamp in France and is regarded as Europe’s most prestigious horse race. It is run over 2400m (about 1.5 miles) and is usually scheduled to take place on the first Sunday in October. Win: A straight win put only has one potential outcome if you are to get a return – your horse must past the post in first position. Place: A place bet is outlaying money on a horse you believe will finish inside the top three. The amount of runners in the race can impact just how many horses will return money on a place bet. Eight or more runners will pay first, second and third. Five to seven runners will only pay first and second. Less than five runners will not have a place market. Each-Way: An each-way bet is technically two bets in one – placing a bet to win and one to place. It just means if your runner wins you will get a little bit more of a return, but if it fails to win but still runs a placing you get a place dividend. Quinella & Exacta: A quinella and exacta bet are almost identical – all you have to do is select the two horses that finish first and second in the race. Where they differ though is a quinella, your runners can finish in any order – an exacta your selections have to finish in the order you select. Trifecta: A trifecta bet gives you the tough task of selecting the horses that will finish first, second and third in the race of your choice. You can box a number of runners (which means the number of your selections, be it four five) to run in any order, or you can choose the exact order you believe they will finish in. Be wary of the overseas import: Many horses travel across the globe to take to the track in the big races, which inevitably means they are unable to acclimatise to the conditions straight away. It can go one of two ways, the horse is cherry ripe for a big crack at a feature overseas, or the horse won’t like the local conditions. Keep an eye on lead-up form and the word coming out of the stable. Observe the conditions on the day: Ever heard the term ‘she loves the slop’? Well, it is not about how the horse likes eating her food – it is all about track conditions. Some horses need a firm ground to find their best form, while others love a wet track. Weather plays such a big role in the outcome of races. A shower of rain and overcast conditions might be great weather for the swimmers, but other horses will either be scratched or struggle. Bet365: The self-proclaimed ‘World’s Favorite Online Sports Betting Company’ backs up their big claim with world-class service. The English favorites have markets on all the big races from around the world, as well as specialty markets and futures markets that go up almost a year in advance, Bet365 is a favourite for investors the world over, with over 200 countries serviced by this bookie. Bovada: There are a lot of companies that claim to be top-shelf in America, but Bovada is one of the only book makers in the States that can honestly make that statement. Terrific odds all year round, money back specials and markets on events all over the world, it will not be long before Bovada is a household name worldwide. USA punters click here to sign-up. Sportsbet: Arguably Australia’s favourite online agency, Sportsbet provide great odds on all the big races. Money back specials, huge promotions and all kinds of novelty markets, Sportsbet is a favourite for Australian punters. William Hill: English bookmaking giants William Hill have made it their business to expand globally, and their persistence has been paying off handsomely. They now have a foothold in many major betting countries like Canada, Australia, UK and some parts of Europe.